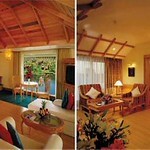 The first 5 star hotel in Thekkady, The Elephant Court is the largest and most luxurious resort in the area. The resort's ideal location make it easy for you to visit Periyar Sanctuary. 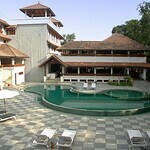 New 5 star deluxe Business class hotel in Ernakulam (Cochin). Luxury at its best with all modern facilities and aminities. Outside city and mainly for conference traffic. Taj Malabar, now named as Vivanta Malabar is a delightful waterfront Hotel on man made island facing the channel, with spectacular views of Cochin Harbor. Le Meridian is on the edge and to the south of Ernakulam on the road to Alappuzha, this is a classic convention style 5 star hotel. Large and modern looking. Large swimming pool. Excellent facilities. 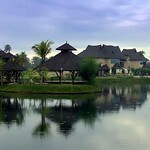 The resort is set at the bank of Vembanadu Lake and very close to Cochin city, features aesthetically crafted rooms, floating pool villas and lake-facing cottages and deluxe rooms. 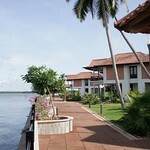 It is a nice place to start your holiday in Kerala. 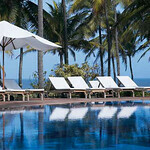 The LaLiT Resort & Spa Bekal is a five star deluxe, boutique resort, located in a sprawling space of 26 acres of land in Kasargod at Bekal near the Bekal Fort. On the Kappil Beach, the Resort spreads over 26 acres and reflects the spirit of the sea and backwaters stylishly woven together.